The 2015-2017 In Colors retire in May. Products will be available while supplies last. So I wanted you to see your options and scoop them up before they are gone forever! This perky card is made with Watermelon Wonder and the Stylized Birthday stamp. 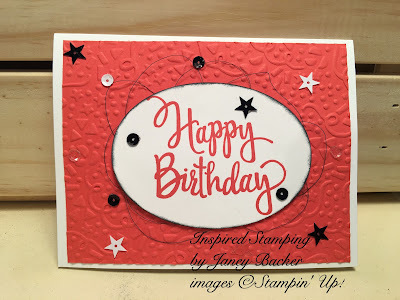 It is big birthday fun with the Confetti embossing folder, black metallic thread, and sequins! Here below are all of the products in the 2015-2017 In Colors.